I've been doing a lot of work with SSIS recently, and learning a lot on the way. One of my tasks over the last week was to convert each row of a result set in to XML and post it to a web service. The web service only accepted one row at a time, and generating XML in SSIS is not the most intuitive of tasks, so I wrote a script component to do the conversion work. The development world has been coming up with ways to improve productivity for years. However since Visual Studio 2010 was released, with its fully extensible model, things have seriously changed. Most tools have been modified to extend VS2010's already pretty awesome IDE. With just a few extensions, you can fill in almost all of the gaps the Visual Studio team have left in the VS experience. I'm not a massive fan of NuGet; I use it, but not for production sites. It's good for quickly implementing a library in a test project, but I just don't like the "bloat" you end up with. I like to know what every single file does and why its there. The same goes for WebMatrix; although handy, I much prefer to manually create projects... I somehow feel like it makes it easier in the long run, even if it takes you a while to set them up in the first place. Recently I've been collaborating via Team Foundation Server 2010 - it's my first time, and I'll be honest... it was very gentle. It eased me in with its promise of improved Source Control (improved over Source Safe, that is) and toyed with me, sporting its ideals surrounding automated builds and work item collaboration. Whilst I've not been directly involved with the set up, using it on a daily basis has been a refreshing change. I'm one of those developers who obsessively refactors code, renames and moves files around until I'm happy everything is in the right place, so when using Source Safe, CVS or SVN, there's quite a bit of repeat work involved when it comes to making sure the source control server is also updated. Suffice to say that TFS 2010 works beautifully in this area, keeping the local, server and project file structure the same as each other. A while ago, I set my default browser in Visual Studio 2010 to Google Chrome by using the "Browse With..." trick, and I've been happy with it for some time. Recently I've found that I've needed to do quite a bit of testing in IE, so I wanted to change it back. I went down the "Browse With..." route again, which seemed to work... but every time I close and re-opened Visual Studio, it reset itself back to Chrome. I've also deleted some of my posts, most notable are the vast majority of the post relating to my bespoke nTier framework. Since I made them, I've made some significant changes, so the old posts don't really represent the end product any more, and will probably just confuse matters. I'm still working on it, and I've made some good progress. I'm also learning a hell of a lot in the process and getting to play with some cool tools like T4 and MVC3, Razor and unobtrusive JQuery. Instead of blogging while I'm writing it, I thought I would develop it as a standalone framework you can download and play with yourself. It's about 85% complete, and although other commitments are taking over at the moment, I'm trying my hardest to get it finished. I'm in the middle of building a security model for one of my clients. They've specified that they want everything done in the ADO.Net Entity Framework 4.1, so I've been working with it quite a lot recently. Though it hasn't made a great first impression, I'll reserve my judgement until a later blog post. One of my main concerns with EF is separation of concerns / layer abstraction. It offers a fairly robust model (with its limits), but in an enterprise environment, you wouldn't want to expose that model to your presentation code. After a bit of digging (and being pointed in the right direction by a colleague), I found the ADO.Net POCO Entity Generator Visual Studio Extension, which isn't available by default... you have to download it via Extension Manager. I've not been that active on the ASP.Net forums for a while, but I did recently outline and troubleshoot a bug in Phil Haack's Route Debugger. 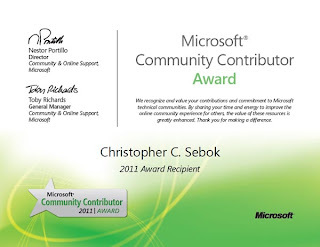 After commenting, Phil sent me an email and I replied... but I've not heard anything else, so I don't really know :) Either way, it's a nice little addition to the CV and I received a few little benefits from Microsoft - time will tell if they're useful to me or not! Following on from my last post complaining about MSSQLMS UI code generation, I thought I would back it up with a few T-SQL scripts that generate code that I actually want to see. I'm currently developing a large scale, real life application using my new .Net 4.0 nTier framework, so I've decided to make my life a little bit easier by generating the boring old CRUD stored procedures with some funky T-SQL scripts. I'm also currently looking in to Visual Studio's T4 code generation tools to help me create my business objects, as most of those will also be fairly standard - though I still need the flexibility to change them (and guarantee that a code generation tool isn't going to overwrite my changes) once the templates have all been created. Since the start of my career I've used SQL Management Studio (or Query Analyser in MSSQL 2000) to manually create my MSSQL database objects via code. This is a practice I have vehemently defended a number of times - being told that producing objects with the UI tools is "quicker" and "easier". Subjectively, I have to agree with this statement - any kind of well designed UI generation tool is almost certainly going to be quicker than writing a load of CREATE statements by hand... there is of course, a caveat. I tend to find that developers who do not fully understand RDBMS' (which is a vast majority, unfortunately), or do not enjoy writing databases always take the quick and easy approach. The problem with allowing a UI to generate code is that a large portion of it is unnecessary, and it's sometimes difficult to read. This is true of most generator engines, including those found in .Net. I recently bought a new NAS (Network Attached Storage) to deal with some of my remote work requirements. Initially I was going to build a server to do the job from spare parts, but I was concerned about power consumption and of course the amount of time it would take to build, configure and administrate. In the end, I had a little look at a few reviews and I decided on the QNAP 219P+. I can honestly say without a doubt that it's one of the best pieces of kit I've bought for a while. It's very feature rich, (almost) everything seems to work perfectly, the interface is well organised and easy to use, and maybe the most important part - it's fast. I'm having a few issues getting the WebDAV service accepting connections, though I think it's Windows' fault, not the QNAP. It's a little on the pricey side for home users, but I didn't mind paying what I did considering how good it is. Recently I've been working on a small project that uses LINQ to SQL as it's data layer (it's a very simple model) and contains two presentation projects - a web form application for the front end and an MVC 3 administration panel. When playing with the unobtrusive validation engine, you'll find many examples on the 'net telling you to decorate your model with various attributes from the System.ComponentModel.DataAnnotations namespace. 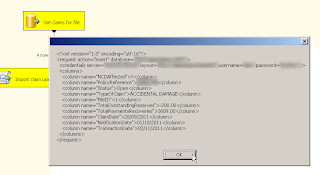 Now, I ran in to a bit of an issue with the LINQ to SQL objects - they're generated dynamically. I could add the attributes, but they would be overwritten any time I made a change to my DBML file. So, after a bit of searching I came across the MetaDataTypeAttribute in the same namespace. This attribute allows you to create a completely separate, standard class and define it as a Meta Data container for another class. Neat, hu?